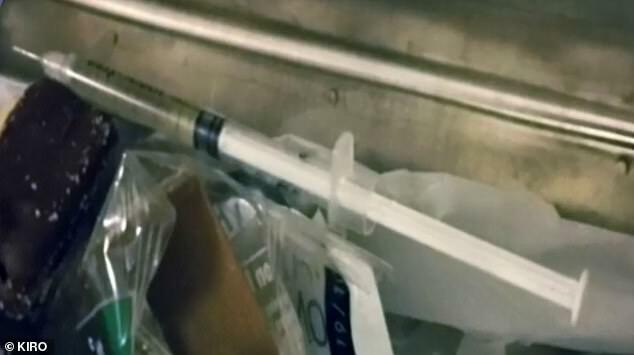 Starbucks has installed boxes in the bathrooms of a select few locations so the public can safely throw out syringes, it has been reported. The coffee giant is responding to complaints from employees who say that they found used needles in bathrooms at a number of locations. 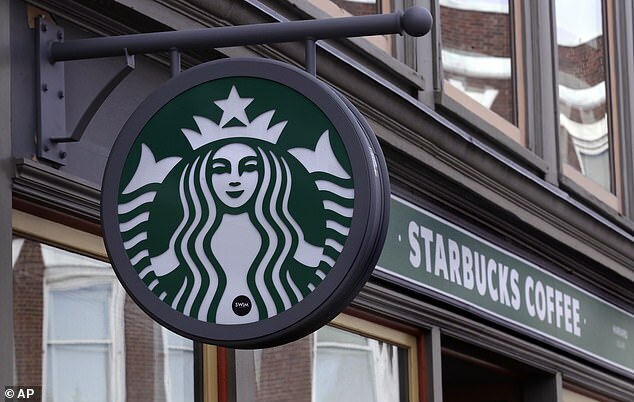 Starbucks employees have complained about being exposed to uncapped needles as well as blood that was found on the floors and walls of the bathrooms, according to Business Insider. The company is now considering other solutions, including disposal boxes, the use of heavy-duty trash bags which would prevent needle pokes, and getting rid of trash cans entirely from certain bathrooms. ‘These societal issues affect us all and can sometimes place our partners (employees) in scary situations, which is why we have protocols and resources in place to ensure our partners are out of harm’s way,’ Starbucks spokesperson Reggie Borges told Business Insider. They were so alarmed by the incident that they rushed to take antiviral medications to protect them from AIDS and hepatitis, according to KIRO-TV. They said it cost nearly $2,000 each to obtain the medicine, which they paid for with loans or on credit. ‘(Needle users) put them in the tampon disposal boxes in the bathrooms, and we have to dig them out,’ one of the baristas told KIRO-TV. The barista spoke anonymously because she feared she would lose her job if she complained publicly. ‘I don’t want to lose my job for being the only one willing to say, “Someone listen to me. Do something about this. My friends are at risk”,’ she said. The three baristas demanded the company install locked needle disposal boxes in all restrooms, particularly in restaurants where drug use is more common. ‘I’m pretty sure it looks worse to have your baristas continuously exposed to HIV and hep C and hep B’ than to have locked boxes for needle disposal in areas open to the public, the barista said. The issue became so dire that a group of Starbucks employees began an online petition on CoWorker.org. 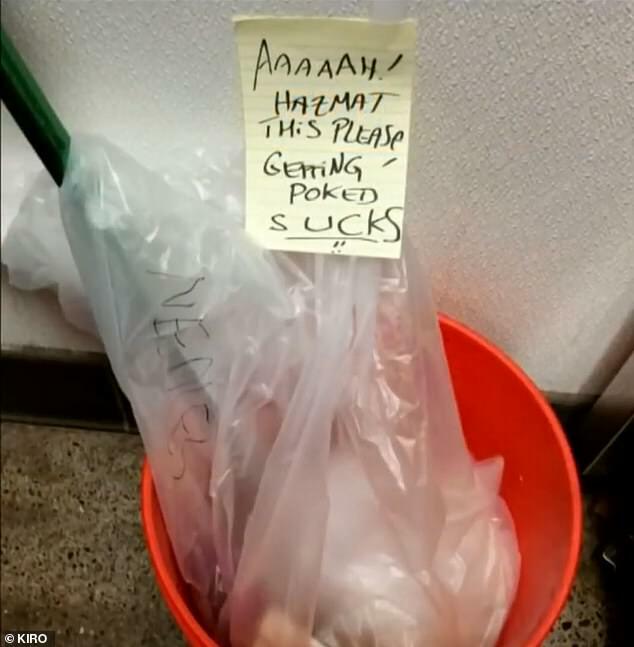 ‘Employees risk getting poked, and DO get poked, even when following “protocol” of using gloves and tongs to dispose of used needles left in bathrooms, tampon disposal boxes, and diaper changing stations,’ the petition reads. After the incident, Starbucks installed sharps boxes in certain locations in and around Seattle. Sharps boxes are containers in which people could safely dispose of discarded needles, syringes, and lancets without the risk of poking employees who handle them. One former Starbucks employee who signed the petition said they worked at a location in Lynnwood, Washington for three years before quitting last year. 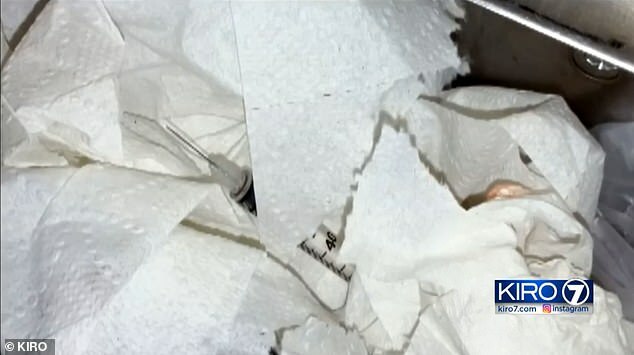 ‘My coworkers and I had all experienced needles left behind in the bathroom, store, and even in our drive-thru,’ said the ex-employee. ‘My primary fear when I worked there would be taking out the bathroom garbages. Starbucks says that it does not force employees who feel uncomfortable handling hypodermic needles to do so. ‘I can’t emphasize enough that if our partners are ever in a position where they don’t feel comfortable completing a task, they are empowered to remove themselves from the situation and alert their manager,’ Borges said. But some workers say that managers ignore company policy especially in the heat of the high-pressure work environment. Starbucks baristas are seeing what many employees who have worked in the restaurant business have experienced over the years. A Starbucks worker from the Minneapolis-St. Paul area told Business Insider that she has cleaned up bathrooms for more than 13 years. During that time, she and her colleagues have picked up or wiped off drugs, bottles of alcohol, blood on the floors and the walls, condoms and condom wrappers, and capped and uncapped needles. Starbucks employees say that their jobs have been made harder after the company announced last May that it would allow non-paying customers to use its facilities. The policy was announced after social media footage emerged of two black men being arrested at a Philadelphia location. They were arrested when employees called the police in response to their refusal to leave the restaurant after they had used the bathroom. The fierce public backlash to the arrest forced the company to change its policy. But the open bathroom policy is having its effect. ‘I think the bathroom policy has definitely changed the store’s environment,’ a manager of a Starbucks in Southern California told Business Insider. 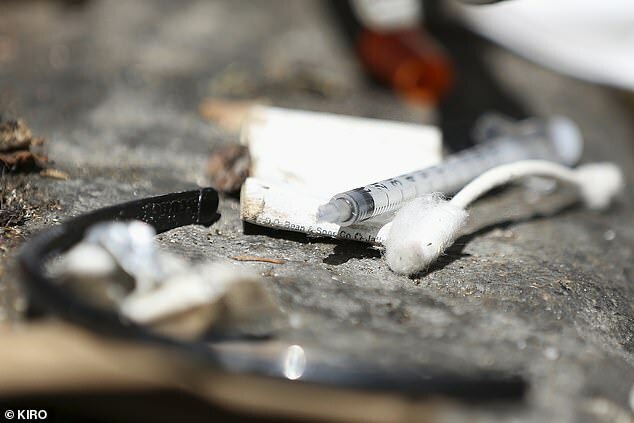 The manager said that workers have been forced to close down the location’s restrooms numerous times after they found drugs, needles, or blood. At least one of the workers was pricked by a stashed needle, the manager said. Others, however, noted that drugs and needles were found in bathrooms well before the new policy was put in place.